The AS100xT NASes are powered by the recently upgraded ADM 2.5 operating system. It's important to note that the new ADM 2.5 uses a different file structure, and you can't roll back to a previous version of ADM after upgrading. To find out more, you can check out the new features of ADM 2.5 here. Note: These are the new features of ADM 2.5. AS100xT NASes don't support MyArchive. ASUSTOR also has a Live Demo if you want to wrap your hands around the UI and check out some of the new features. If you want to learn more about the ASUSTOR NAS or want to get more out of the ASUSTOR NAS that you already own, be sure to check out the ASUSTOR College. The image below shows the landing page on the AS1004T test unit. ADM 2.5.0.R9B2 firmware was loaded onto an AS1004T and performance tests were run using the Revision 5 NAS test process. Since the AS1002T uses the same processor, RAM and Ethernet components, all testing was done on the AS1004T. The AS1004T tests used four drives configured in single RAID 0, 5 and 10 volumes. The AS1002T tests used two drives in single RAID 0 and 1 volumes. All tests were run using Western Digital Red 1 TB (WD10EFRX) drives (x4 SNB supplied). The composite image below shows how the AS1002T and the AS1004T compare to other products for File Copy Write Performance. The File Copy Write test the AS1002T turned in 108.1 MB/s - slightly below the slightly better performing NASes clustered around 110 MB/s. The AS1004T, at 107.5 MB/s was slightly slower than the other top ranking NASes. Note that quite a few NASes in both charts are clustered around 110 MB/s. That's about the maximum throughput that can be achieved with single client Gigabit Ethernet testing. As noted above, for the two drive comparison, I chose the ASUSTOR AS-202TE and the Western Digital My Cloud Mirror Gen2, which are shown in the benchmark summaries below. The ASUSTOR AS1002T turned in better than 100 MB/s for all File Copy read and write operations except for RAID 1 File Copy Read which was 94.5 MB/s. The WD My Cloud Mirror Gen2 had very similar performance except for RAID 1 File Copy Write which was only 88.3 MB/s. Both of those NASes significantly outperformed the AS-202TE on most tests. The only area where the AS-202TE did better than the AS1002T was on iSCSI Write and Reads. (The WD Mirror Gen 2 doesn't support iSCSI.) The AS1002T had the poorest USB 3 backup performance of the three by a significant margin. The NAS Ranker, filtered for RAID1 and Revision 5 testing shows the ASUSTOR AS1002T ranked #8, between the NETGEAR ReadyNAS 212 at #7 and WD DL2100 at #9. The AS-202TE ranks near the bottom of the charts at #13. If you sort the RAID 1 NAS Ranker by price, you'll generate the chart below. The $200 AS1002T is the cheapest two-bay NAS. Spending an extra $50 moves you up to the #4 ranked NETGEAR ReadyNAS 202. The chart below shows individual and category scores for the same three NASes shown in the two drive benchmark summaries above. The AS1002T outperformed the other two NASes for the Write, Read and Mixed Read categories. It placed second behind the WD My Cloud Mirror Gen 2 for the Video category. Not surprisingly based on the benchmark results, the AS1002T's total NAS rankings were pulled down by poor backup performance. Given the backup tests were abnormally low, a RAID1 volume was re-created after RAID 5 tests were done and the test repeated. Results did not change. For four drive NASes, I compared the AS1004T, ASUSTOR AS-204TE and Western Digital My Cloud Expert Series EX4100. With one exception, both the AS1004T and the WD EX4100 came close to maxing out the throughput of a single Ethernet client at well over 100 MB/s for File Copy Write and Read performance for all RAID levels. The exception was the AS1004T, that exhibited lower RAID 5 file copy write performance of 79.0 MB/s. Similarly, the AS1004T had lower than expected results (87.0 MB/s) for NASPT File Copy to NAS for RAID 5. The RAID 10 NASPT file copy tests for both read and write for the AS1004T as well as the WD EX4100 were over 100 MB/s. While the AS1004T turned in better USB 3.0 backup results than the AS1002T, the results for both it and AS-204TE fell significantly below the excellent USB 3.0 backup performance of the WD EX4100. Of the three NASes compared, the AS1004T has the slowest iSCSI Write and Read performance. Notably, the AS1004T's iSCSI write was quite a bit slower than iSCSI read - 64.4 MB/s and 81.4 MB/s respectively. Using the NAS Ranker to show RAID5 products, ranks the AS1004T at #20, just above its AS-304T sibling. Even though ranked at #20, the AS1004T provides the best bang for the buck at $339. 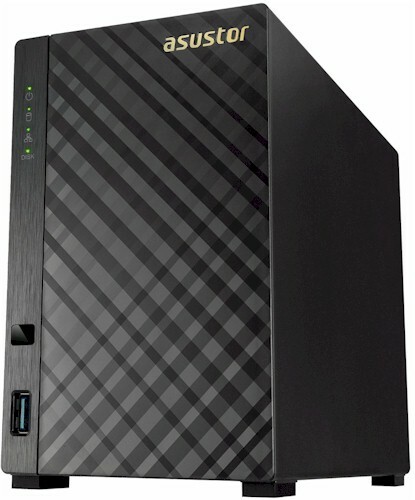 To get a higher-ranked product, you need to move up to the diskless WD EX4100 at #14 for $380. Looking at the RAID 5 performance subcategories, there weren't really any surprises based on the benchmark summary chart. The AS1004T outperformed the WD EX4100 for Write, Read and Video benchmark categories. The EX4100 held a slight edge for mixed the Read Write category, and was the clear winner for USB Backup and held a slight edge over the other two for the iSCSI category. The AS1004T's low performance on iSCSI Write and Read dragged it below the category rankings for both the AS-204TE and the EX4100. The AS-204TE had significantly poorer performance than the other two NASes for both Write and Read benchmarks ranking #24 and #21 respectively. 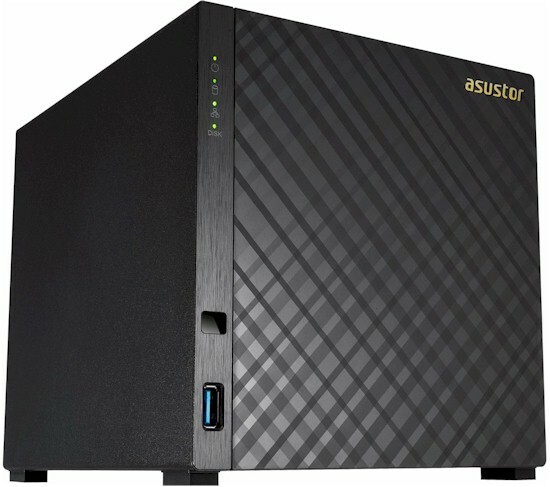 For two-bay NASes, ASUSTOR has the two least expensive products of the ones that we've recently tested. The #8 ranked AS1002T is $200, and from a performance perspective, outperforms the next most expensive NAS, the #12 ranked $247 ASUSTOR AS-202TE. Of course, the AS1002T lacks the HDMI/Audio output capabilities that might make the AS202TE a more attractive option for someone looking to connect their NAS to a HDTV. The #3 ranked NETGEAR RN202-100NES priced at $250 also will give you a bump in performance as well as BTRFS snapshot capabilities if you're willing to cough up a 25% premium over the AS1002T. For four-bay NASes, the AS1004T, like its sibling, offers a lot of performance for the dollar. Bear in mind that for RAD 5 capable NASes, we have significantly more products in our chart, and some of them are significantly more expensive. Ranked at #20 with a price of $339, there are no other RAID5 NASes that offer better performance for less money. But the competition is stiffer in the RAID5 capable market. In only costs about 40 bucks more to move up from #20 to the #14 ranked Western Digital EX4100 or about $70 to move up to the #9 ranked AS5004T. In looking at the ASUSTOR lineup, it looks like there are some models that could soon will become redundant. With the exception of the HDMI capabilities of the AS-20xTE products, the AS100xT is a better performing replacement for less money. Similarly, with the ASUSTOR AS-304T having the same price as the AS5004T but with a significantly lower ranking, you have to wonder how long before the AS-30xT line will be discontinued. In many of our reviews of ASUSTOR NASes, we've concluded that ASUSTOR offers a lot of bang for the buck. The performance of many of their products nears the top of the charts at very aggressive prices. The new AS100xT series is no exception.